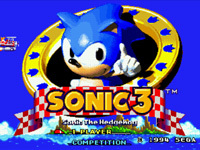 Sonic The Hedgehog 3 takes place on the mysterious Floating Island which holds many special powers. The source of these powers are the Chaos Emeralds. In Sonic The Hedgehog 2, Sonic and Tails thought that they had destroyed the Death Egg, which was Dr. Robotnik's heavily armoured ship. Instead, Dr. Robotnik managed to crash land on the Floating Island. After learning that the island is able to float in the sky by harnessing the power of the emeralds, the Doc decides to steal the emeralds so he can repair his Death Egg ship. The story begins immediately following the events of Sonic 2: after being knocked out of the sky by Sonic and Tails, the fallen Death Egg plummets toward the surface of the planet. In its wild descent, the plunging fortress enters a tremendous cloud and collides with a hidden floating island. The force of the impact pushes the island out of the sky and into the surface of the ocean, triggering a massive tsunami. Meanwhile, on another part of the beach, Sonic is enjoying a seaside nap when a tiny ring with mysterious engravings washes up on the shore. Sonic investigates the strange ring and recalls a legend he once heard of a great civilization that built its society around the "stone of power". The civilization flourished until a faction of elders, driven by greed, attempted to utilize the "stone of power" for their own designs. They inadvertently unleashed a force greater than they could control, resulting in the collapse of their entire society. The race was forgotten until years later, when the gods descended from heaven and restored a portion of the civilization to a small island - the legendary Angel Island, which floats in the air as a result of the energy emitted by the "stone of power". Excited by the prospect of a new adventure, Sonic and Tails hop aboard the Tornado and set out in the direction of the powerful Emerald readings. As soon as the fallen island is in sight, Sonic transforms into Super Sonic and dashes onto the shore. His flight to the island's interior, however, is cut short by an ambush from a mysterious red echidna. The assailant knocks the seven Chaos Emeralds clean out of Super Sonic's grasp, and quickly collects the scattered jewels before the now plain blue Sonic can get to his feet. With a condescending scoff, the red stranger escapes with his prize, leaving Sonic and Tails to piece together the mystery of the island and the unprovoked attack. Knuckles immediately begins conducting a fruitless search for the missing Emeralds. His investigation leads him into the forest, where he encounters a strange man. The moustached stranger introduces himself as Dr. Eggman, a scientist conducting research on the giant egg. He explains that there is an evil hedgehog named Sonic who is interfering with his study, and who is after the Chaos Emeralds. The well-meaning but hopelessly gullible Knuckles falls for Eggman's lie and immediately sets out to stop Sonic and recover the "stolen" Emeralds. Level Section- Wait till the SEGA Logo runs and Sonic starts to appear on the screen. Quickly Press Up, Up, Down, Down, Up, Up, Up and Up. Remember to do this VERY Quickly. If it has worked, you will hear a noise. On the Main Title screen, if you move down a 'Sound Test'. Enter that and you can level Select. Via Hacking the Sonic 3 ROM, fans have found artwork showing Sonic on a surf board. The story goes that it seamed the Original intro was going to be Sonic riding to the Island on a Surfboard. There he carries on with the level. The First Meeting with Knuckles thus happens at the end of the first level. It is unknown how much of this is true but it appears to be the case from a couple of beta Screenshots. A Fan hack has restored this original opening to as close as possible at this time. ScreenShot is from 'Hack' Restored intro. Due to time and the Amount of space on a ROM Cart, It was not possible to place all of Sonic 3 on to the cartage. 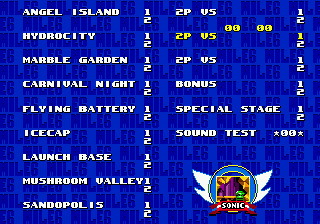 A Quick job was done to remove some of the levels and reintroduce them (in a different order) as 'Sonic 3 Part Two', or 'Sonic And Knuckles' as it became known. 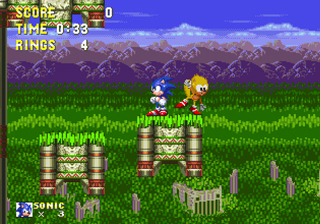 A Number of changes were done for the SnK version (including featuring Knuckles as Playable) but the Original Level order can be found via the Sonic 3 Level Selection. 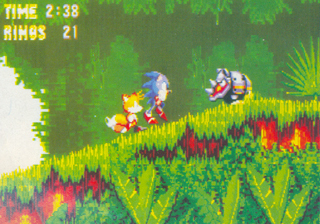 It shows off a Sonic 2 Style level selection, showing it is in fact the Sonic 2 Engine, and even has the place holder Art work from Sonic 2 (Including 'Deleted' levels) It appears this was never meant to be an gamer cheat but a debug tool, thus the appearance of the Special zones and Bonus games. Using this Order, it is pretty easy to see how the levels would tie in. The cannon blast at the end of Carnival Night would throw you up to the Flying Battery, you will fall from that into the IceCap zone etc.. It is a bit Unclear as to Launch base onwards but it would appear that Sonic would have a chance to finish off Robotnik After stopping his Death Egg. 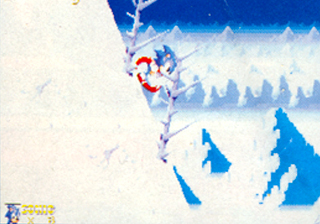 An Image printed in STC shows the Snowboarding Intro for Ice Cap Act 1 BUT without the Snowboard. Sonic is just running down the hill. I would guess that this is linked to the early level setup Or maybe the removed intro. 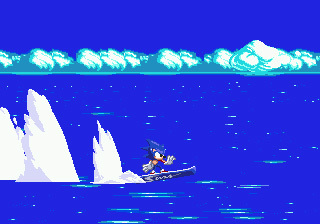 Maybe after removing the surfing intro, the team really wanted to stick something of it in, and did so with ice cap? doubt it... but possible. It Seams Sonic was very busy in 1993. An article printed in STC issue 5 talks about the large number of Sonic related stuff on it's way. Not only is Sonic Spinball, 'CD Sonic' (later known as Sonic CD and two more games there are two new pals for Sonic. His girlfriend Amy Rose and.... Ray? An Early issue said bout Sonic's Arcade game which stars him and his new pal Ray (no word about Mighty at that time) but it appears that Ray is going to return in Sonic 3! But Tails will still be around (though probably not for that game)... In a way, the lettering of the Article gives the impression that maybe he was planned but mostly seams to be saying there are new characters (and a Tails replacement) in the game.. it turned out only to be Knuckles. They say it's only a rumour and it's unknown how far this rumour went. Maybe there were plans to have Ray in the game, but it is pretty doubtful. So we have to make do with my mock-up image.. Ray Sprite by Manic Man. The Ladybird released puzzle book 'Where's Sonic Now' features a few things that might be removed features, since most of the time these books are made with stuff given from the company themselves. It is only about 25% trustworthy but still. The first two 'puzzle pages' are Angel Island Zone 1 and 2 (Act 1 and 2 that should be) and are fairly right to the level apart from two details. 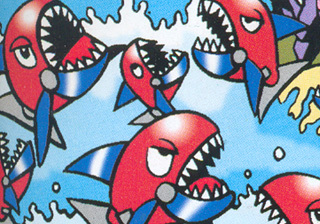 The first is more Water really and the other is a badnik that looks a lot like Sonic 2's Chopper. Now, it is possible (and maybe likely) that a Chopper was planed for that level but it was felt it didn't really go well thus was removed. This is fairly likely and has happened in the past. Sonic 2 was to feature the Snail bot (an Upgrade from the Motobug) but it was removed. It DID, however feature things like the Grounder that was an upgrade from the Burrow Bot, so it's possible that there was an idea to do a Chopper based Badnik in this game but removed it. If you look at the Knuckles Sprite from Sonic 3 when he is an Enemy and compare it to when he is playable you notice something. 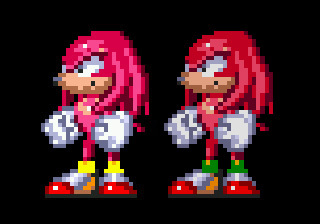 As pictured, when you compare the sprites, you notice Knuckles 'rims' on his Sneakers are in fact Yellow in the original and Green in the Final one. This seams to be a quick mistake as if you notice the final one still has one spot of Yellow where it wasn't changed fully. Never really a big mystery but for anyone that wondered about that spot, here is the answer. For Some reason, Knuckles shade was also changed from Pink to Red. Though this appears to have been done pretty early on, the Enemy version of Knuckles still has this problem in the final version.